The Insider Monkey team has completed processing the quarterly 13F filings for the December quarter submitted by the hedge funds and other money managers included in our extensive database. Most hedge fund investors endured a torrid quarter, which certainly propelled them to adjust their equity holdings so as to maintain the desired risk profile. As a result, the relevancy of these public filings and their content is indisputable, as they may reveal numerous high-potential stocks. The following article will discuss the smart money sentiment towards IDEX Corporation (NYSE:IEX). IDEX Corporation (NYSE:IEX) was in 19 hedge funds’ portfolios at the end of the fourth quarter of 2018. IEX has seen a decrease in hedge fund interest recently. 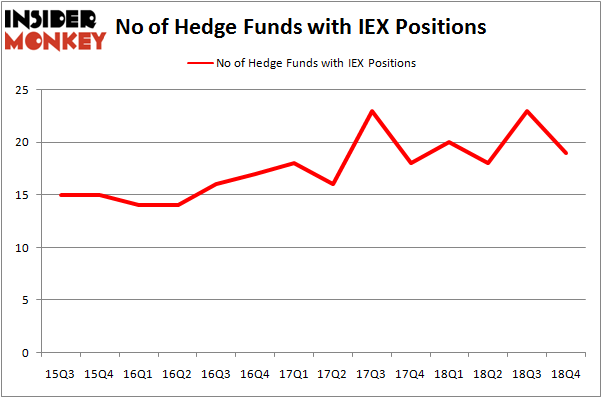 There were 23 hedge funds in our database with IEX positions at the end of the previous quarter. Our calculations also showed that IEX isn’t among the 30 most popular stocks among hedge funds. If you’d ask most traders, hedge funds are perceived as slow, old financial tools of the past. While there are more than 8000 funds with their doors open at present, Our researchers choose to focus on the masters of this group, about 750 funds. These money managers command bulk of the smart money’s total capital, and by paying attention to their highest performing picks, Insider Monkey has figured out a number of investment strategies that have historically outpaced the broader indices. Insider Monkey’s flagship hedge fund strategy outrun the S&P 500 index by nearly 5 percentage points annually since its inception in May 2014 through early November 2018. We were able to generate large returns even by identifying short candidates. Our portfolio of short stocks lost 27.5% since February 2017 (through March 12th) even though the market was up nearly 25% during the same period. We just shared a list of 6 short targets in our latest quarterly update and they are already down an average of 6% in less than a month. We’re going to take a glance at the key hedge fund action surrounding IDEX Corporation (NYSE:IEX). At the end of the fourth quarter, a total of 19 of the hedge funds tracked by Insider Monkey were bullish on this stock, a change of -17% from the previous quarter. Below, you can check out the change in hedge fund sentiment towards IEX over the last 14 quarters. So, let’s review which hedge funds were among the top holders of the stock and which hedge funds were making big moves. More specifically, Impax Asset Management was the largest shareholder of IDEX Corporation (NYSE:IEX), with a stake worth $156.6 million reported as of the end of September. Trailing Impax Asset Management was GAMCO Investors, which amassed a stake valued at $56.8 million. AQR Capital Management, Millennium Management, and Citadel Investment Group were also very fond of the stock, giving the stock large weights in their portfolios. Due to the fact that IDEX Corporation (NYSE:IEX) has experienced bearish sentiment from the entirety of the hedge funds we track, it’s easy to see that there lies a certain “tier” of hedgies that slashed their entire stakes by the end of the third quarter. 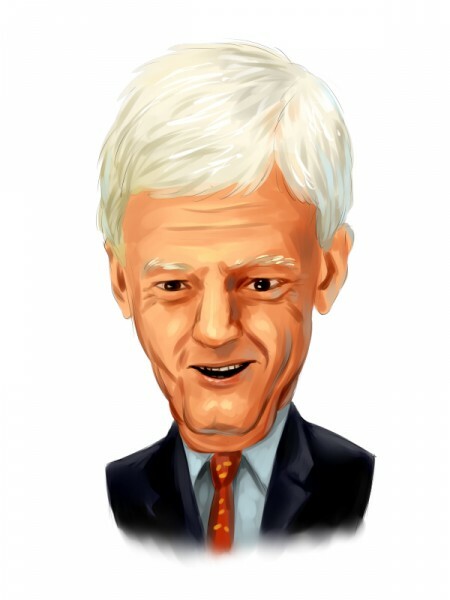 Intriguingly, Mark Moore’s ThornTree Capital Partners dropped the largest investment of all the hedgies monitored by Insider Monkey, comprising close to $24.8 million in stock. Jim Simons’s fund, Renaissance Technologies, also said goodbye to its stock, about $11.4 million worth. These bearish behaviors are intriguing to say the least, as total hedge fund interest dropped by 4 funds by the end of the third quarter. Let’s go over hedge fund activity in other stocks – not necessarily in the same industry as IDEX Corporation (NYSE:IEX) but similarly valued. We will take a look at Cabot Oil & Gas Corporation (NYSE:COG), The AES Corporation (NYSE:AES), Brookfield Infrastructure Partners L.P. (NYSE:BIP), and Pinnacle West Capital Corporation (NYSE:PNW). This group of stocks’ market caps match IEX’s market cap. As you can see these stocks had an average of 24 hedge funds with bullish positions and the average amount invested in these stocks was $477 million. That figure was $274 million in IEX’s case. Cabot Oil & Gas Corporation (NYSE:COG) is the most popular stock in this table. On the other hand Brookfield Infrastructure Partners L.P. (NYSE:BIP) is the least popular one with only 8 bullish hedge fund positions. IDEX Corporation (NYSE:IEX) is not the least popular stock in this group but hedge fund interest is still below average. This is a slightly negative signal and we’d rather spend our time researching stocks that hedge funds are piling on. Our calculations showed that top 15 most popular stocks among hedge funds returned 19.7% through March 15th and outperformed the S&P 500 ETF (SPY) by 6.6 percentage points. Hedge funds were also right about betting on IEX, though not to the same extent, as the stock returned 17.3% and outperformed the market as well. 5 American Companies that Will Benefit From the End of the Trade War Were Hedge Funds Right About Souring On Teck Resources Ltd (TECK)? 5 Ways to Play the Autonomous Driving Trend 4 Ways To Play the Ride Sharing Trend Sarissa Capital Management Hires New President Were Hedge Funds Right About Souring On News Corp (NWSA)?